BRT are pleased to announce some further changes to their TV programme schedules for BRT 2 TV and A Cup of Conversation and Vox Pop TV shows have been re-scheduled as below with repeat viewings. We do listen to your requests and are pleased to give you two shows for the price of one. the 17th of August, tune into BRT 2 TV at 7pm to watch my interview with Halle and Samet from Pottery Barn. We will be chatting about the success of their venture and also their love for art and sharing new and exciting ideas with the people of North Cyprus. I invite you to join them in their enthusiasm for life and feel their energy! The repeat of the show is on Tuesday the 20th of August at 12 noon. Catch us also online from www.brtk.net. 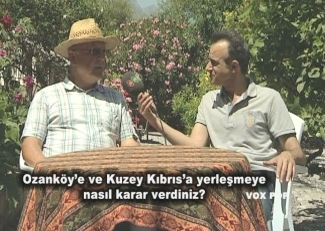 This weekend on VOX Pop, my colleague Engin Dervişağa brings you a fascinating interview on Sunday 18th August at 10.30am with Gavin Simons, a local vocalist and acoustic and bass guitar player. bands in the U.K His style of music is Blues, Country and Rock and the most recent band he has played with is the Rocking Aces- a 50s/60s style rock ‘n’ roll band. Gavin first visited Cyprus at 14 then re-discovered this lovely island in 1997 and he bought his house in 2000 before moving to North Cyprus in December 2011. As a solo artist, Gavin sings and plays guitar and can be seen performing in various restaurants in North Cyprus. Engin’s show will also be repeated on Monday 19th August at 12.00 noon.